SES is one of the leaders when it comes to Geotechnical, Structural, Sound and Vibration Monitoring and the proof is in our track record. 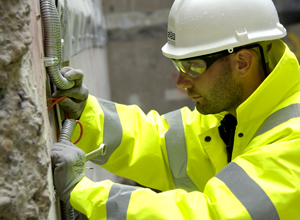 SES is able to provide a wide range of survey monitoring services through the utilisation of survey techniques adapted for monitoring as well as using technologically advanced methods specifically designed for the monitoring environment. Over the past 20 years we have built committed relationships with our instrumentation suppliers, these partnerships have proved essential in our development as market leaders. 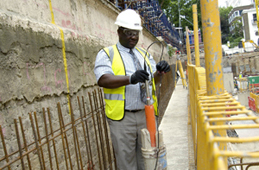 Monitoring is carried out when buildings are demolished, assesing movement of adjacent structures or retained facades; for deep basement excavations, checking for movement of retaining walls and surrounding buildings or during the construction of tunnels, measuring possible movements within the tunnel and the above surface features. At SES we believe that monitoring is twofold. We work closely with consultants and structural engineers in providing detailed information on precisely how their designed structure is deviating during the construction process. They compare our real-world "live" data to their theoretical models, and with this information they are able to push the limits of design for future builds. Additionally, monitoring becomes an important tool in today's world where there is an interference with a third party structure. Monitoring systems are useful not only as an early indicator of potential problems, but also as a means to disprove any perception of movement or damage if movement is not occuring. To avoid litigation it is beneficial for the project managers to have a monitoring system in place. SES designs monitoring regimes, utilising our experience and technical know-how to provide a cost-effective and efficient monitoring system to best suit the client's requirements. However we are not limited to the above. SES is continually pushing the boundaries when it comes to innovation. With technology on the advance, we are working with our instrumentation suppliers to deliver an unsurpassed service to our clients.